I have an xdf someone else attempted for the MSS54 and they have the 18x3 full-throttle fuel table titled as AFR and using compu-method of (1881.6/x), instead of the A2L's (x/128), to formulate the values. tap posted this, and what he came up with looks more along the lines of full throttle fueling. What do you guys think? I really want to make sure I'm consistent with these calculations, and that any associated changes made to the values result in the desired effect. I have people hitting me up for xdf's, and I don't mind doing them, but the last thing I want to do is hand something over that could potentially cause some damage. most DMEs work in lambda, not AFR. the problem with AFR is the "stoich" AFR value changes with the type of fuel you use (gasoline, ethanol). Whereas lambda 1.0 is always stoich no matter what fuel you use. as long as you label it a lambda table, I'm in favor of leaving it in the original units. it's also quite reasonable to go very lean or even completely cut off fuel at high RPM, low load. Belay my last... This makes more sense..
Last edited by SliM3; Thu, Jan-03-2013 at 04:24:46 PM. the full throttle map may be different because it's open loop. while long term trims will applly, it doesn't use real-time O2 feedback. 1881.6 = 128*14.7 -- since tap got his values by inverting and multiplying by 14.7, I'd say both are correct. The discrepencies in the values are probably due to difference between US/Euro/old/new variants. yeah, it looks like the 1881.6 is converting them to AFR and the original A2L calculation leaves them as lambda. you already know my opinion on that. Guys what are your thoughts on increasing injector size and the possible map(s), curve(s) and/or scalar(s) that would need adjustment? Please try and consider the whole gambit, from start-up to full throttle. Also, throw in MAF replacement. Want to see what you all think..
you would need to change the injector constants (reaction times and size). 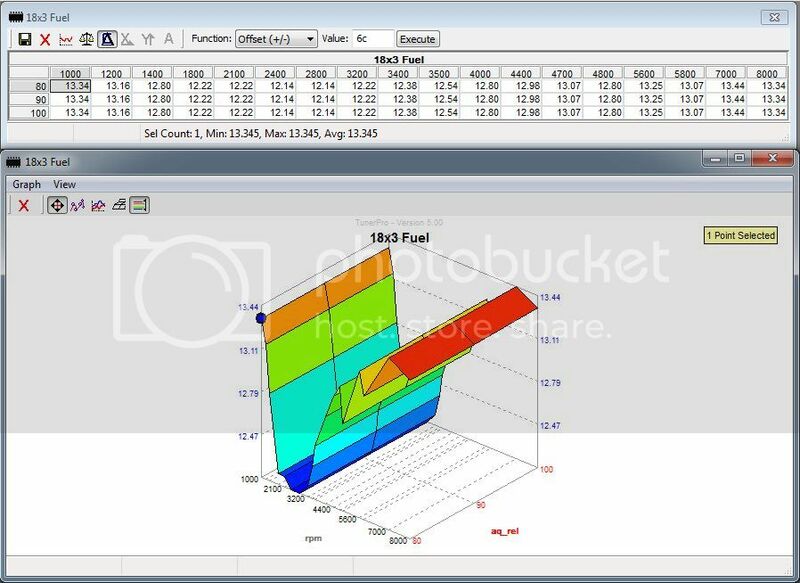 If the DME is smart enough you wouldn't have to do a lot with the fuel maps, that's what injector constants are for. You would have to change the cranking pulse and priming pulse tables (anyone see those yet? ), but those aren't too bad, basically a % change based on your injector size changes. Those should be the only "pre-determined" injector pulse maps, after that injector MS is calculated. an HFM re-map would have to show the same fuel output for a given air-mass. so maybe 3v is 100kg/hr = 10ms injector duration (I'm really simplifying here), but with the larger HFM now 1.5v is 100kg/hr which still = 10ms of duration. Basically as long as you enter in the calibration for the HFM correctly (volts vs mass) it should work out on it's own, because the DME uses the mass to calculate fueling and not volts. but this is sort of educated guessing.. I think we need to find what all these do and maybe do some testing first. Might be interesting to you guys. I think I found the curves describing resistance vs temperature for the intake, radiator outlet, engine coolant, and DME temperature. The A2L doesn't give actually give the units for resistance, but I'm going to assume it's ohms. We could probably figure it out with a little experimentation either way. Last edited by terraphantm; Thu, Jan-03-2013 at 06:31:38 PM. if they are bosch sensors you can usually just get the curves from a datasheet. I've got all of them on my workbench that I can measure. I think they were pretty standard sensors for BMW. The standard m3 temp sensor is integrated into the MAF housing. CSL's is separate, but I don't know the Bosch part number. The IAT sensor built into the MAF is 2500 ohms, the CSL IAT sensor has a different resistance, but appears to be commonly used in non M3 E46s, E36/E38/E39s as well as X3/X5s. The temp curves for the non CSL should be in the PDF i posted earlier. All times are GMT. The time now is 12:05:36 AM.